Goodness, it was quite hot outside in New York today! A nice cold beer would do the trick, but how about a beer tasting with friends?? We love this idea! Super casual yet fun and festive with the graphic coasters and chalk writing on the table -- gives off a gastropub look! Wouldn't you want to hang with friends at this table?? 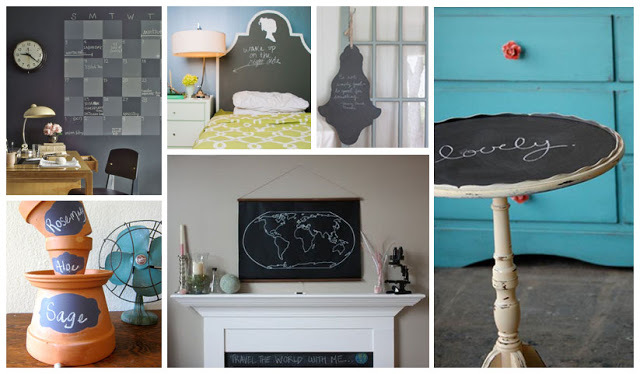 Use chalk paint on anything and everything and have some fun! You can paint your walls, bed frame, side tables and even home accessories. You, your family and friends will get a kick outta writing on non-traditional items with chalk, trust me -- I know I would! Adding chalk paint to your home gives a personal touch and invites people to express themselves, explore their creativity and even lead to wonderful chalk masterpieces. It's truly an organic feel and I would highly recommend this to anyone who wants to promote creativity in their abodes!